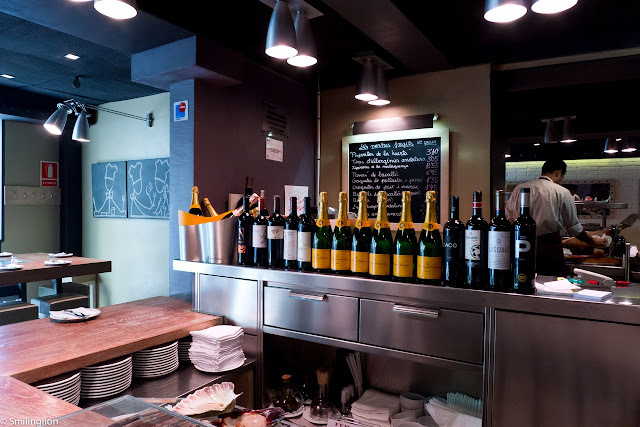 When we were planning our trip to Barcelona, one of the more difficult things we had to figure out was where to eat on a Sunday, when most restaurants are usually closed for the day. 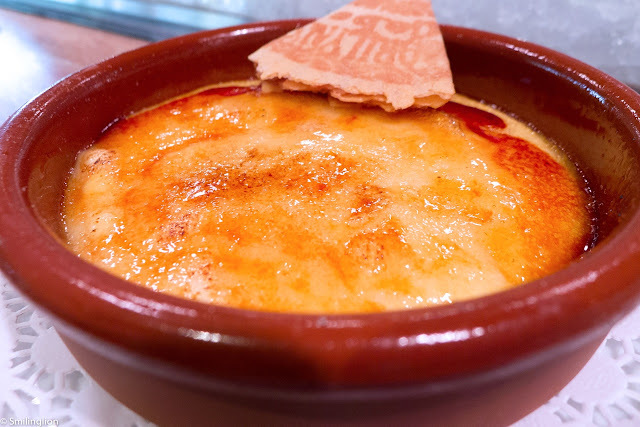 We didn't want to settle for one of the touristy places along Passeig de Garcia or Rambla de Catalunya, so it was important for us to find a good restaurant open that day. After some research, it was clear that we needed to try Paco Meralgo in Eixample, which was open both for lunch and dinner on Sunday. They generally took reservations for their table seats, but we were told that the bar counter seats had a brisk turnover (they obviously hadn't had many Singaporean diners there yet; we usually sit at tapas bars all day long) and that there wasn't a real need to reserve a seat at the bar. We landed in Barcelona early that morning after a 15 hour flight and had to walk around Barcelona all morning while waiting for our hotel to check us in and the restaurants to open. By 11am we were famished and had to settle for a few small plates of tapas at TapaTapa along Passeig de Gracia (the food was cheap and decent for a tourist joint but it was troubling that the majority of its clientele was Asian), however, we were careful not to ruin our appetite for our lunch at Paco Meralgo after. By 1pm when Paco Meralgo opened, we were promptly at their doors and were the first seated at the bar (it was quite obvious to them that we were hungry). We liked the interior of the restaurant. 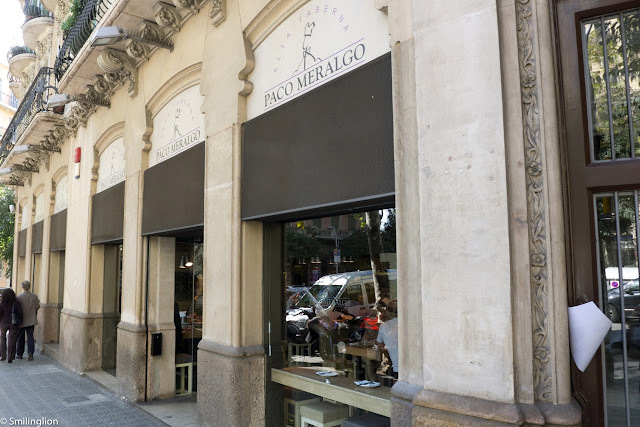 It was modern and had good visibility of the street outside (the restaurant is located at a cross junction in Eixample and we enjoyed watching the world go by through the large glass windows). 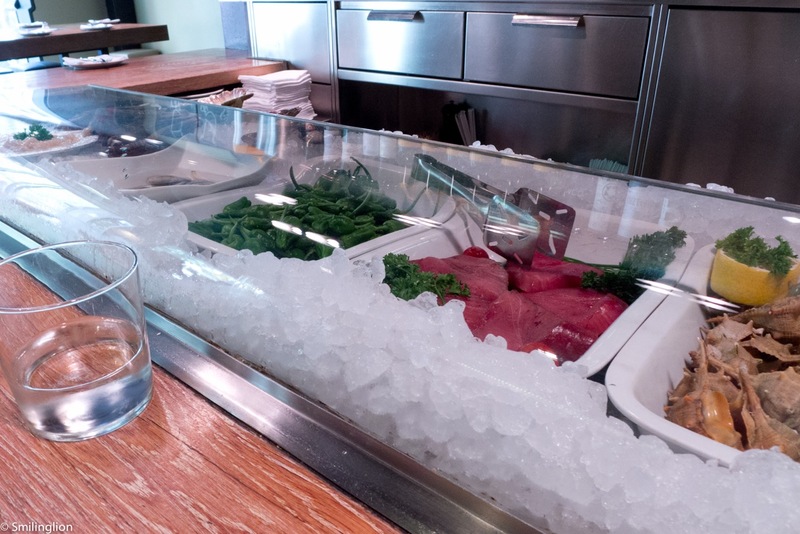 At the bar counter were glass cases which enclosed raw and cooked food, not unlike a sushi restaurant. The only complaint we had was that they played a bizarre music selection at the restaurant, which included songs by Richard Marx, ABBA, the Carpenters, mixed with modern hits by U2, Taio Cruz etc. Listening to that eclectic collection of music was almost suicide-inducing at times. The waiters were very friendly and were quick to explain some of their tapas as well as make some recommendations, while pouring us some cava. They had an English menu, but we basically went with whatever the waiter suggested instead. After taking our orders, the food took a while to arrive as the chefs needed to fire up the kitchen, but when the first dishes arrived, the rest came in quick succession, at a pace not dissimilar to that of a sushi counter. 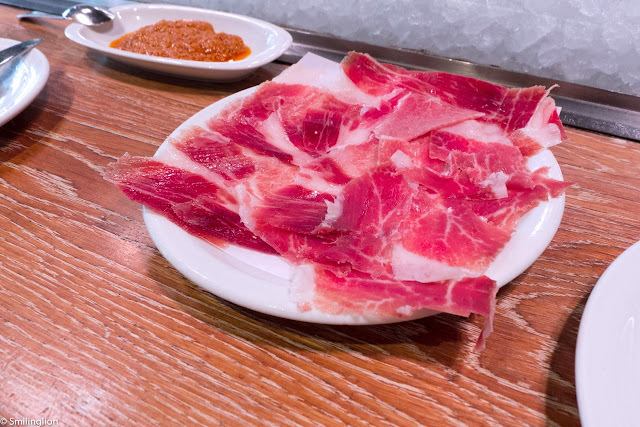 The first was a huge serving of bread with tomato and olive oil, then followed by delicious Bellota Jamon. 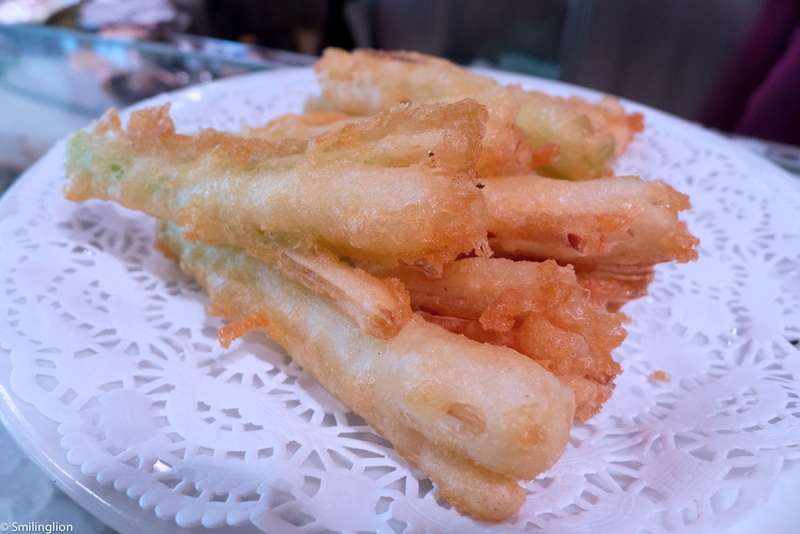 Tempura spring onion was next, and was surprisingly good despite my lack of enthusiasm towards spring onion (the batter was light and fluffy while the spring onion provided the sweetness). 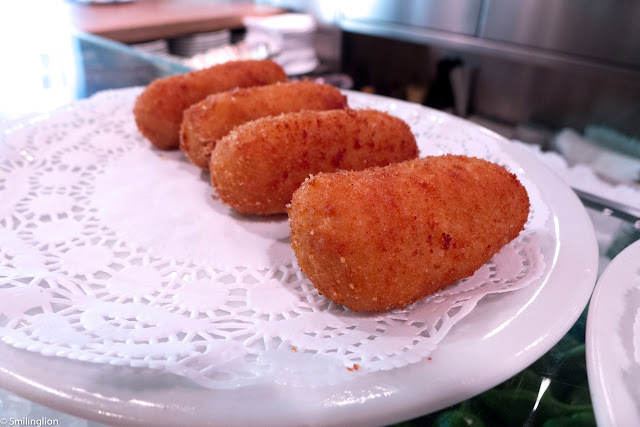 We've had croquettes at tapas bars in Singapore but our first in Spain really blew us away. 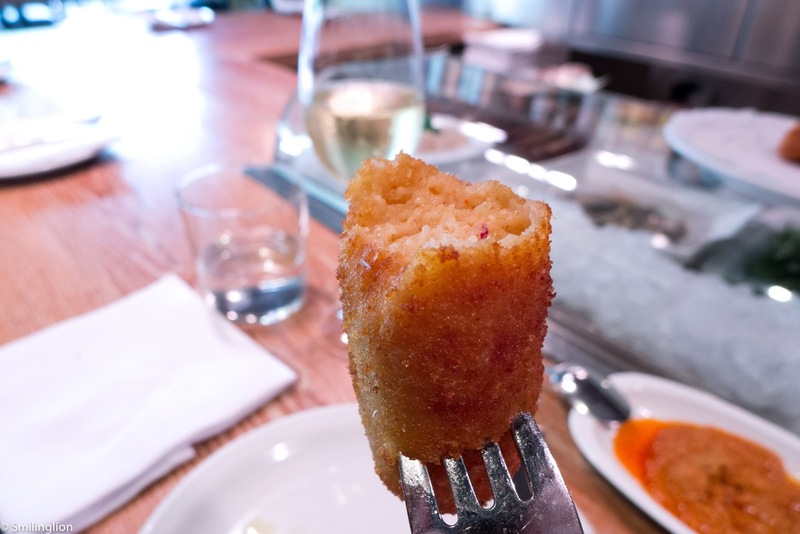 The fish and seafood croquettes were amazing, and tasted like they were made with seafood bouillabaisse and finely minced fish and prawns. 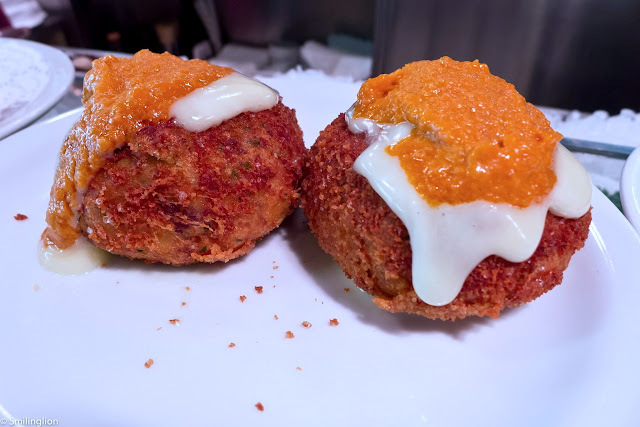 The big spicy Bombas (meat balls) were equally good, and were topped with a very spicy jalepeno paste and mayonnaise. 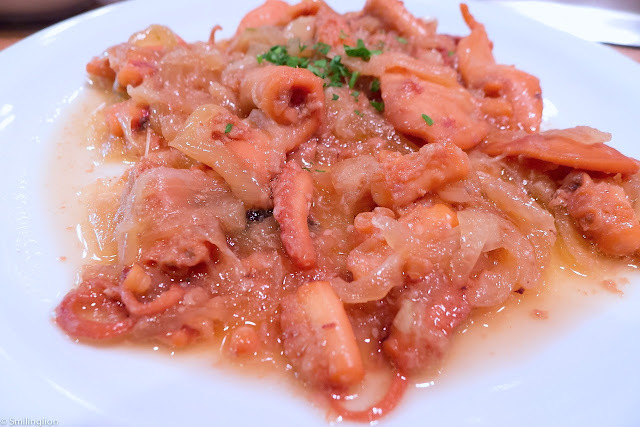 The local octopus with candied onion didn't do so well with us, as the octopus was quite chewy and despite the sweetness of the caramalised onions, we felt that insufficient seafood stock was used in cooking this dish. The last of our savouries was the breaded suckling kid cutlets which were very juicy but were quite small portions (of meat) for that price and didn't appear to be breaded at all. Nonetheless, we were quite sated by that point and were grateful that the portions of this dish weren't any bigger. For desserts, we had the catalan custard which was essentially a creme brulee but with a custard which tasted more eggy. Finally, a strange looking dessert arrived: the Torrija de Sta. Teresa (i.e. 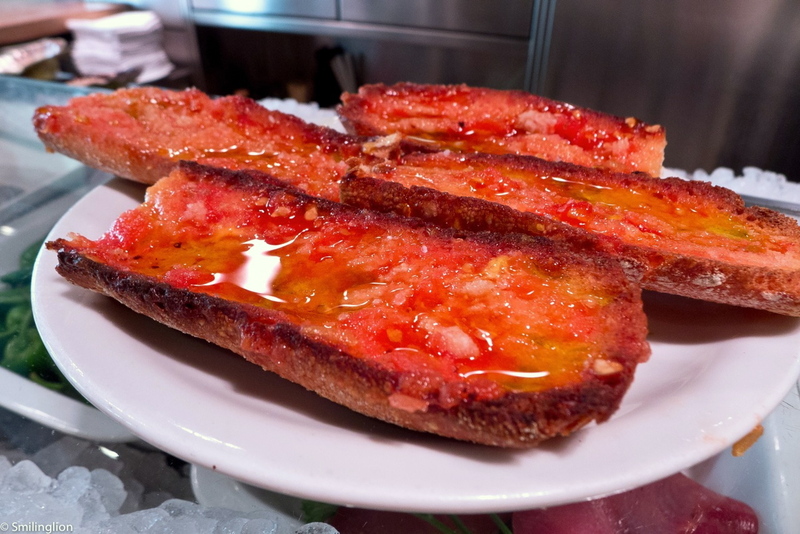 catalan french toast). 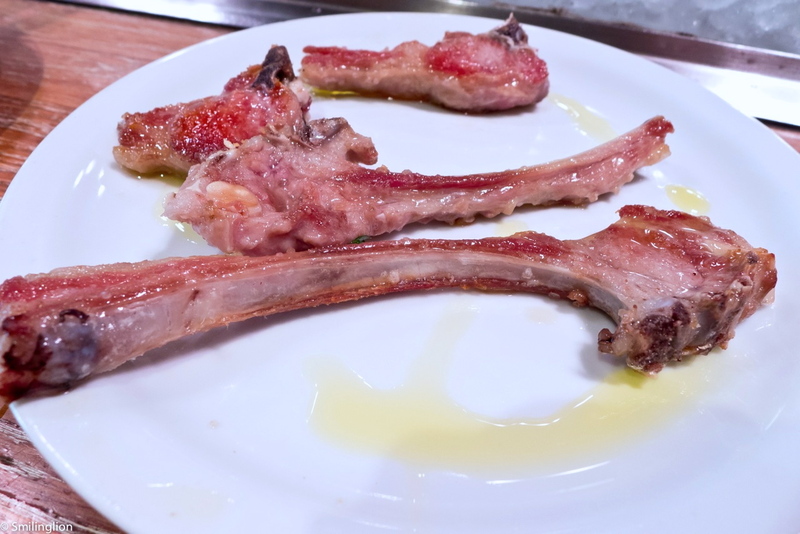 We had this before at Catalunya in Singapore and weren't particularly impressed, and the one we were just served looked even more suspicious. But when we tucked into it, it all finally made sense. The most humble dish of the meal was also the best. 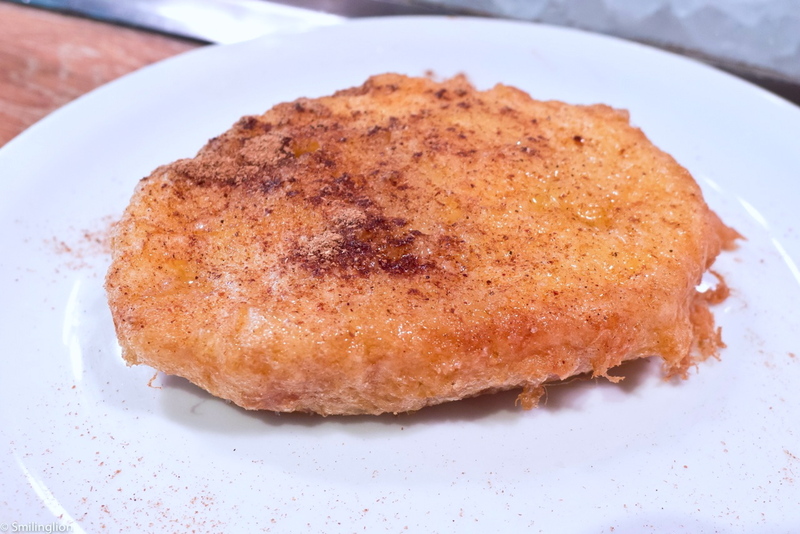 This was no mere french toast; it was very light bread soaked with copious amounts of custard and then deep-fried to give and crispy outer layer, with a sprinkling of cinnamon powder. We loved it. Final Thoughts: The food here was very good and the restaurant spacious and comfortable, and we enjoyed our Sunday lunch. The torrija was so memorable (and the best we had tried during our 15 day Spain trip) and as a result we went back to Paco Meralgo two more times (once after our lunch at Hisop a short walk away, and the other at midnight after dinner at Tickets on our last day in Spain) just to eat that. At lunch the first time round, the crowd was mostly local, but when we got there late at night again, there was a large tourist crowd. Given that this is open on Sunday, it is top of our list of places to eat at on a day when most other good tapas places are closed.